Grade "A" Herkimer Diamond crystals. They are very clear, bright and quite stunning little gems. Some have "babies", some with inclusions. Most are at least 1/4 inch. Fine tunes aura energy with the emotional, mental and spiritual bodies. Aligns the physical and spiritual self. Connects us to the universal grid, aids in soul retrieval, and fosters the comfort and healing of the inner soul. Creates mental clarity, expands awareness, fosters a positive outlook and brings harmony within. Herkimer Diamonds have a Trigonal crystal system and are in the mineral class of oxides in the Quartz group. They are a unique form of Quartz that generally crystallize as double-terminated, very clear crystals. Their compact formation makes them slightly harder than regular quartz, but not as hard as diamonds. This pseudo diamond received its name from its place of discovery, Herkimer, New York. They are also found in some areas of Spain and in Oaxacca, Mexico. The ones I carry have come from both locations. They can sometimes contain rutile strands (black streaks-generally a form of Tourmaline) which seems to provide an extra zip to their energy. 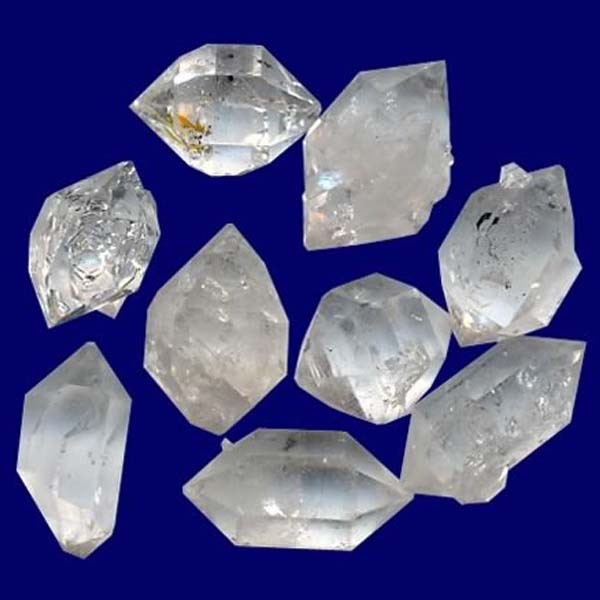 As with most gemstones, Herkimer Diamonds are best used when held or laid upon the body. It can be quite beneficial to use a Herkimer prior to laying on of other stones as it will bring about a deep relaxation making you more open to the other gems healing energies. 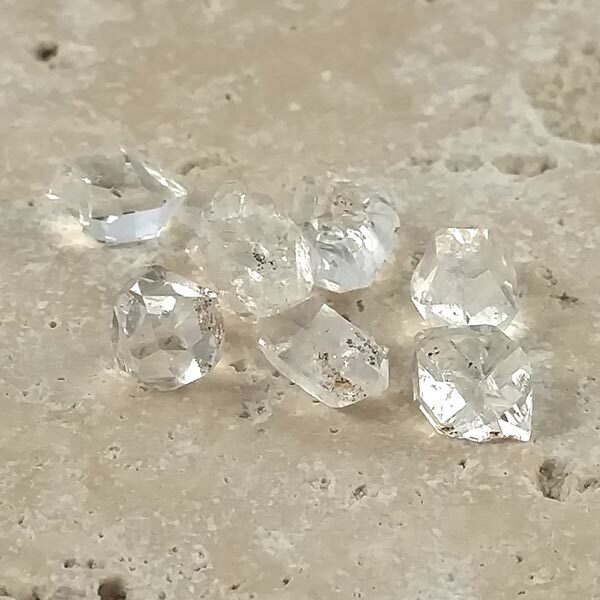 Herkimer Diamonds can provide the ability to recognize the essential being within you, allowing it to "be." In this aspect, they provide the appreciation of the essential being (not of the self) that resides in us all. Herkimer Diamonds assist in removing tension and provide a calming effect, helping to align the energy structure of its user. Herkimer Diamonds can aid in the path to beginning again in this life. They allow you to recognize your own inner space and to remember that there is nothing to "become," one is what they have already been seeking, our minds just need to allow the actualization. Herkimer Diamonds are useful for the dispersal of toxins that have accumulated in the body and also aid in rebuilding the cellular structure. They have also been used to correct imbalances in the metabolic rate. For those who work in proximity to radioactive materials, wearing one will provide protection and facilitate dissipation of harmful rays. They seem to release tensions or rigidity of body tissues which assists in recovering the memory of those areas and facilitates healing at a deep level. Herkimer Diamonds have a special affinity with the sign of Sagittarius, but are beneficial to all signs. They have a Projective Energy, their Planet is the Sun and their Element is Fire. It is told that if two people wish to attune themselves to each other, two of these lovely gems should be held simultaneously. After, each can carry one and be attuned to the other person even though the gems are separated. This can also work to attune groups together as well.